Hyderabad recently celebrated the 425th anniversary of its inception. Hyderabad recently celebrated the 425th anniversary of its inception when Muhammed Quli Qutb Shah (1580-1611 CE), the fifth sultan of the Qutb Shahi dynasty of Golconda laid the foundation of its iconic Charminar to symbolise the founding of Hyderabad. Hyderabad was intended as a citadel of Muslim power in the Deccan. Qutb Shah was an accomplished poet and wrote his poetry in Persian, Telugu and Urdu. His famous ghazal “Piya baaj pyaala piya jaye na, piya baaj ek din jiya jaye na” is still a favorite in soirees. In 1589, CE Muhammed Quli Qutb Shah married a Hindu woman, Bhagmati, reputed to be a courtesan and she remained with him as his Queen till his death in 1611 CE. The sultan bestowed the title of Hyder Mahal on Bhagmati and hence the name of the new city as Hyderabad. Muslim power came to dominance in the Deccan after the defeat of the Vijayanagar forces under the septuagenarian King Rama Raya at Talikota in 1564 by an alliance of the sultanates of Ahmednagar, Bijapur and Golconda. In the next few decades Golconda emerged as the most-powerful sultanate in the Deccan and was the last to fall to Aurangazeb in 1687. After the death of Aurangazeb in 1707 and as the Moghul Empire weakened, the Viceroy of the Deccan, Mir Qamruddin Siddiqui assumed the title Nizam-ul-Mulk in 1724 and declared independence. He founded the Asaf Jah dynasty that extended from the Narmada in the north to Trichinopoly in the South and Masulipatnam in the east to Bijapur in the west. Both the Qutb Shahi and Asaf Jahi kings employed Hindus in important positions in their courts. Muhammed Quli Qutb Shah notably employed the brothers Akkanna and Madanna as his viziers. The two brothers employed their nephew Kancharla Gopanna, better known as Bhakta Ramadasu, as the Tehsildar of Palavancha Taluq in the present-day Khammam district of Telangana. Ramadasu was a devotee of Rama and expended large sums mulcted from the sultan’s treasury to expand and endow the historical Rama temple at Bhadrachalam on the north bank of the Godavari. For his pains he was rewarded by incarceration at the dungeons of the Golconda fort. With plenty of time on his hands he composed many kirtanas to Rama’s glory for which he is now famous. These kirtanas were mostly laments to his chosen God about his plight owing to his devotion and commitment to glorify him. In one famous kirtana “Ishvaku kula tilaka” Ramadasu actually lists out how much he spent on every construction and item of jewellery to adorn the deities. The story ends with a fable. The deities one night appeared before the Qutb Shah and urged him to release Ramadasu, which the entranced Sultan promptly did. This and the fact that his beloved Bhagmati, later on Queen Hyder Mahal, as well as the favorite courtesans of his grandson Abdullah Qutb Shah being two Hindu ladies called Taramati and Premamati, who are now immortalised with a dancing pavilion and mosque named after them, gave the Qutb Shahi kings a reputation for cultural and philosophical syncretism. The early Asaf Jah kings were made of sterner stuff in keeping with the traditions established by Aurangazeb, but soon they came to rely on noblemen from the north who found their way to the Deccan escaping the ruins of the great Mughal Empire and later from the dwindling fortunes of the rulers of Oudh. Even though several Hindu courtiers reached high positions in the Asaf Jah dispensation they were exceptions. The Deva Raya kings of Vijayanagar and the Maratha courts, too, had Muslims holding high offices, but they, too, were exceptions. The point here is that despite the extravagant talk of “Ganga-Jamuna tehzeeb” that suffuses the hindsight view of this period, the two communities largely stood apart. Where the rulers were of one, the other was the subject community. At the time of India’s independence, Hyderabad was the largest Indian princely state in terms of population and GNP. Its territory of 82,698 sq. miles was more than that of England and Scotland put together. The 1941 Census had estimated its population to be 16.34 million, over 85 per cent of them Hindus, with Muslims accounting for about 12 per cent. It was also a multi-lingual state consisting of those speaking Telugu (48.2 per cent), Marathi (26.4 per cent), Kannada (12.3 per cent) and Urdu (10.3 per cent). Its diversity and broad heritage could be seen in the historical monuments at Ajanta, Ellora and Daulatabad in Marathwada, Bijapur, Bidar, Gulbarga, Anegondi and Kampili in Karnataka, and Warangal and Nagarjunakonda in Telangana. Hyderabad not only had its own Army, but also its own Railways, Airline, Postal Service, Radio Broadcasting network and Currency. The Nizam and his court ruled over it with the British Resident keeping a close and watchful eye over everything. The British Army also had a permanent garrison, just in case the “faithful ally of the King Emperor” was found lacking in faith. As can be imagined it was a Muslim-dominated state. Typically in 1911, 70 per cent of the police, 55 per cent of the army and 26 per cent of the public administration were Muslims. In 1941 a report on the Civil Service revealed that of the 1,765 officers, 1,268 were Muslims, 421 were Hindus, and 121 others, presumably British, Christians, Parsis and Sikhs. Of the officials drawing a pay between Rs 600-Rs 1,200 pm, 59 were Muslims, 38 were “others”, and a mere five were Hindus. The Nizam and his nobles, who were mostly Muslims, owned 40 per cent of the total land in the kingdom. Quite clearly it was too much of a good thing for so few and the time for its end had come. If Hyderabad was to be a citadel of Muslim power in the Deccan, that ended in September 1948 when the Indian Army quickly scattered the ragtag forces opposing union with India and with dreams of hoisting the Asafia flag on the ramparts of the Red Fort. This is the first time in over 350 years Hyderabad and the state that bore its name came under non-Muslim rule. Nothing epitomised the change of elite than the change of guard at the elite Secunderabad Club. In March 1949, the President Maj. Gen. El Edroos who surrendered to the Indian Army’s Maj. Gen. J.N. Chaudhry surrendered the presidentship of the club also to him. For a brief period till 1956 Hyderabad had a national elite at its bureaucratic and social pinnacles. Senior civil servants drawn from all over the country were at the helm of government. My father who joined the civil service in the early 1930s in the Hyderabad Revenue Service and then joined the Indian Army to serve in the war, returned to the bureaucracy as a member of the new national elite, the IAS. When he joined the HRS he had to perforce wear a sherwani and fez for all official functions. The official languages were Urdu and Persian. I recently found an old official photograph in formal attire of the revenue officers serving in Warangal. 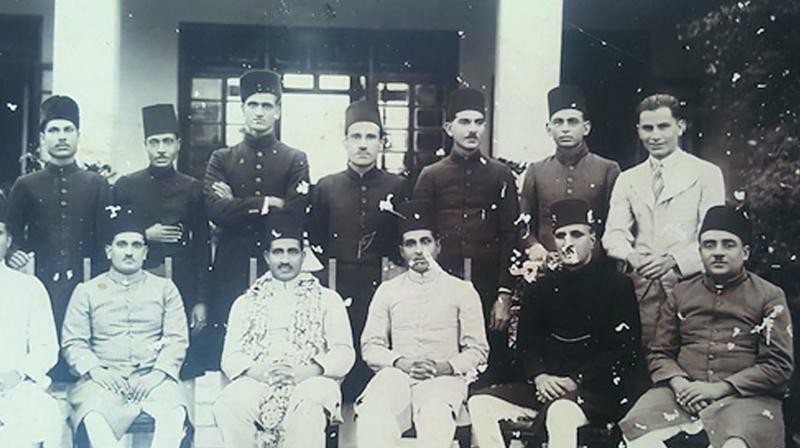 My father is third from the left in the second row. When he returned to the civil service the bush coat and solar topee was in vogue for the new elite. Government was now conducted in English, and from 1956 in some part in Telugu. But that changed in 1956 when Hyderabad state was dismembered following the re-organisation of states. Hyderabad became the capital of a composite state of the Telugu-speaking people. It was several centuries before that that the Telugu people had lost power at Orugallu (Warangal) and Vijayanagar. Hyderabad now began to lose its Muslim character and the culture, which its Muslim elite fostered and cherished, and gave the city its unique identity. Along with the change of guard the city lost more. It lost its clean streets, skyline of elegant buildings and a genteel lifestyle. It grew pell-mell to become India's fifth largest metropolis and fastest growing urban area in India. Many people miss the old Hyderabad. But most didn't even notice.